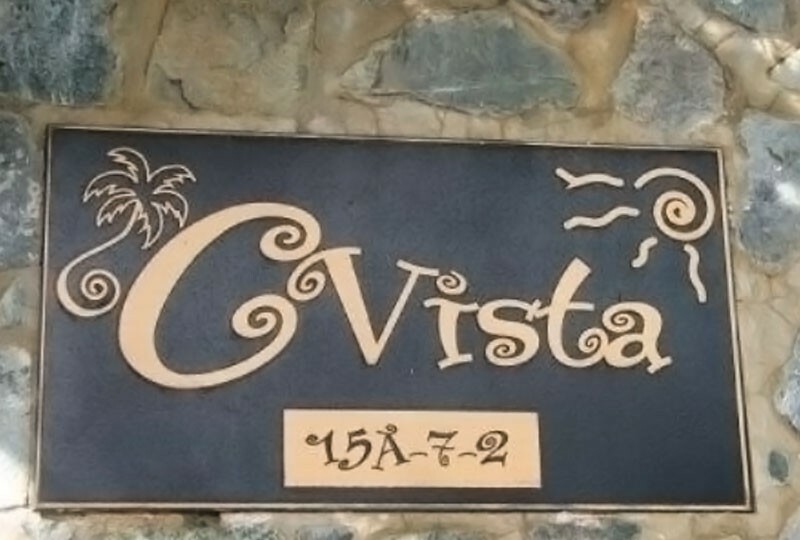 CVista is St. John’s newest luxury vacation villa. 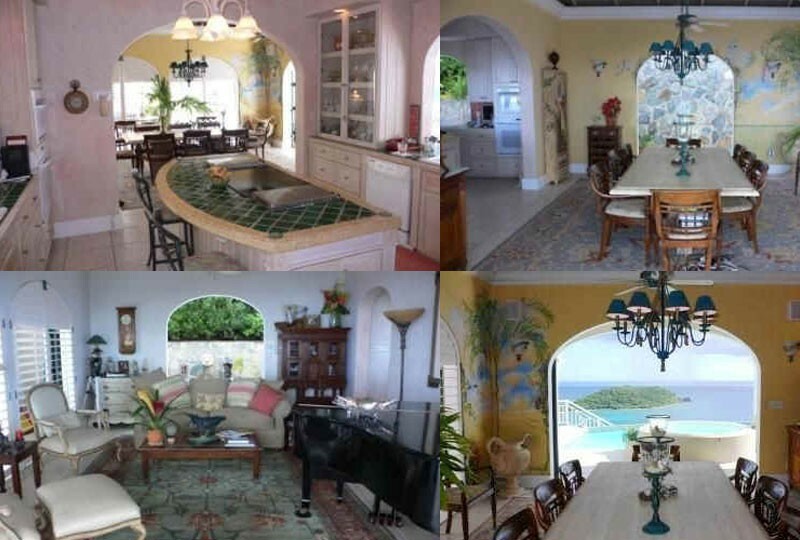 This premier open air villa overlooks the alluring turquoise waters of rendezvous Bay. Located on the south side in the prestigious Klein Bay neighborhood. Featuring two equal king master suites as well as two additional king suites for a total of four bedrooms. 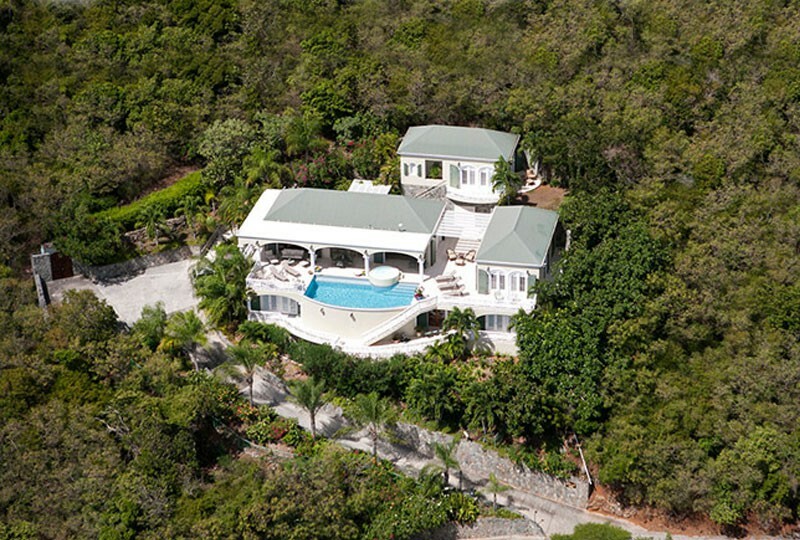 Upon entering this gated estate you will find a lovely half moon shaped fountain with a large lion head waterfall. Continuing along the courtyard you come to the large gas grill built into a native stone wall with light and cooking shelf. 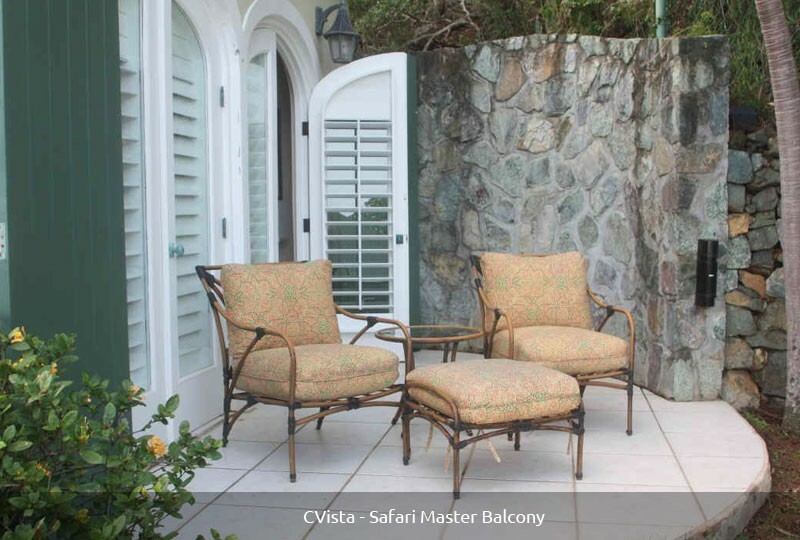 From this area you can access the stairs to the Safari Master Suite, the Formal Living Area, the Dining Area or around to the CView Master Suite or Pool and Spa areas. 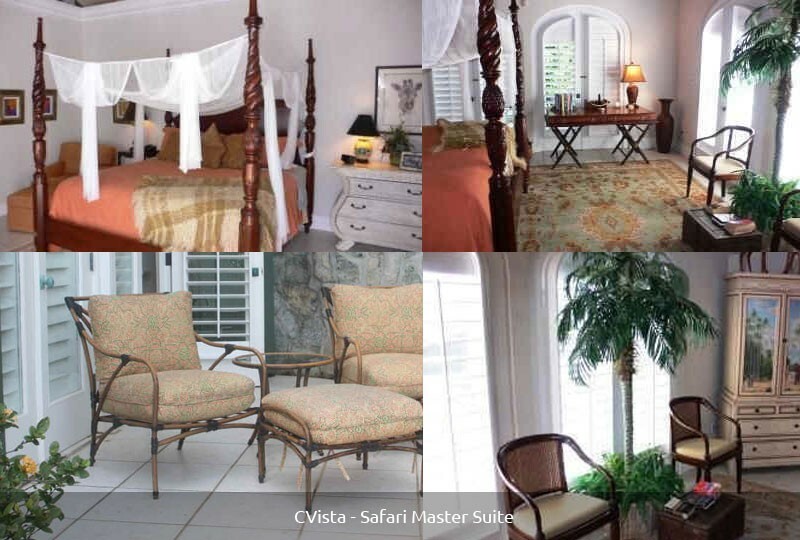 The Safari Master Suite located on the highest level boasts vaulted ceilings with a stately four poster king mahogany bed. A wicker dresser, nightstand and sitting chair with ottoman are also included for your comfort. A large walk in closet, ceiling fans and air conditioning are also available. 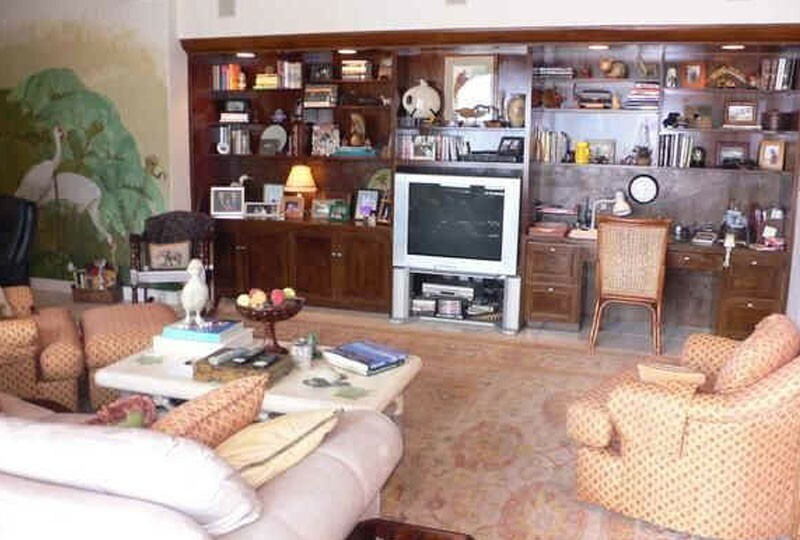 The Safari Suite sitting area includes two chairs, large secretary desk and a lovely hand painted armoire includes a 27″ Sony TV with Expanded Cable, Sony combo VHS & DVD Player and a Yamaha Receiver with 5 Disc CD Player. 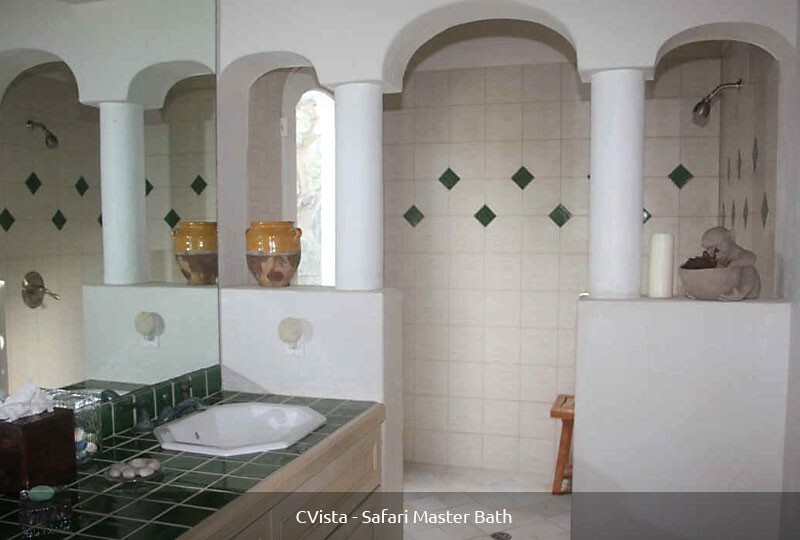 The Safari Suite Master Bath features double sinks inlayed with vibrant green tiles. A full size inside shower is included as well as a private outside shower featuring the a native stone wall. The Safari Suite private outside balcony is a great place to relax, read a book or just gaze out to the vibrant blue ocean beyond. 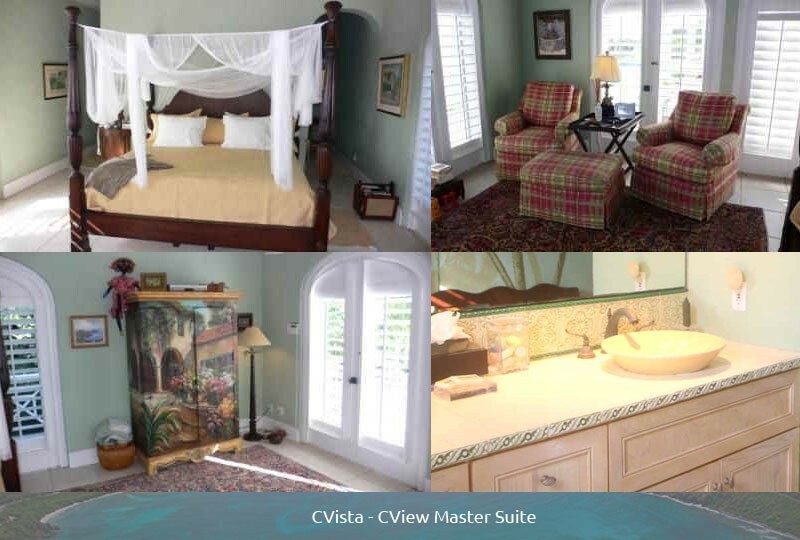 The CView Master Suite is located on the main level, perfect for those who prefer little or no stairs. 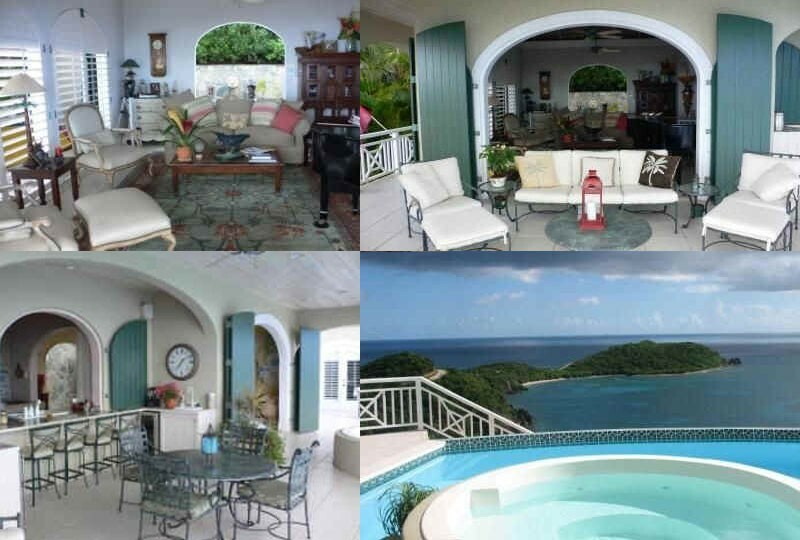 This suite also has vaulted ceilings and grand views overlooking Ditleff Point, Fish Bay and south to St. Croix. A king sized mahogany four poster bed with night stand and floor lamp for bedside reading on either side. A large walk in closet is included for all your Caribbean attire and air conditioning as well as ceiling fans. 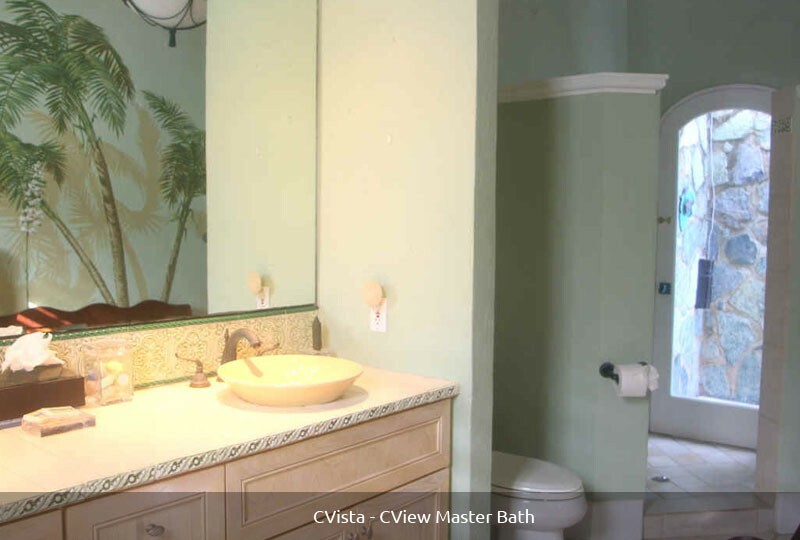 The CView Master Bath features double sinks and a large mahogany bench. The feature wall with hand painted palm trees can be admired while showering in the large inside shower. A private outside shower featuring a native stone wall with expansive water views is a unique experience to be had. The CView Master Suite sitting area includes two comfortable chairs with table, lamp and ottoman perfect for reading or relaxing. A lovely hand painted armoire includes a 32″ Sony flat screen tv with cable and a JVC combo DVD & VCR player. The kitchen has two arched windows on the north and south side. Each with a sink with double sinks. One looking out to the grill area the other overlooking the pool and outdoor bar area. 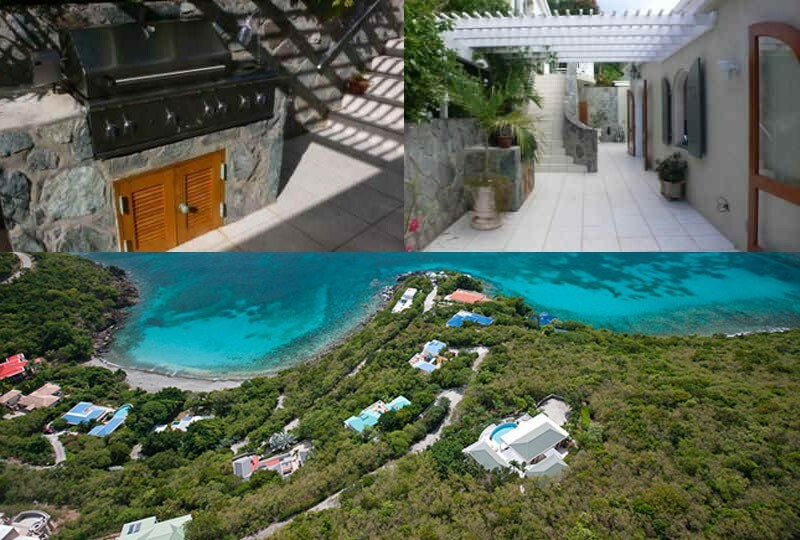 Lovely views of Klein Bay and Ditleff Point can be admired from the kitchen as well as the pool, spa and deck areas. The fully equipped gourmet kitchen includes a Sub-Zero refrigerator with water and ice dispenser, Kitchen Aid electric cook top with a deep fryer on one side and a gas burner on the other. An oven, microwave and two sinks and all the dining and serving pieces the novice or advanced chef would desire. The formal dining area features a comfortable sofa, two leather sitting chairs with ottoman, coffee table, floor lamps, entertainment center complete with cordless phone, stereo system with receiver and cd player. I large music library is included for your pleasure. This room also features a lovely baby grand piano player for the novice or advancer player or any music lover. The outside living area is just beyond the arched doors leading out to the deck. This includes a large comfortable sofa, and two sitting chairs with ottomans. The outside bar area features four comfortable bar stools, a mini refrigerator, ice maker and wine cooler. This covered deck area also features a table with seating for four or six. 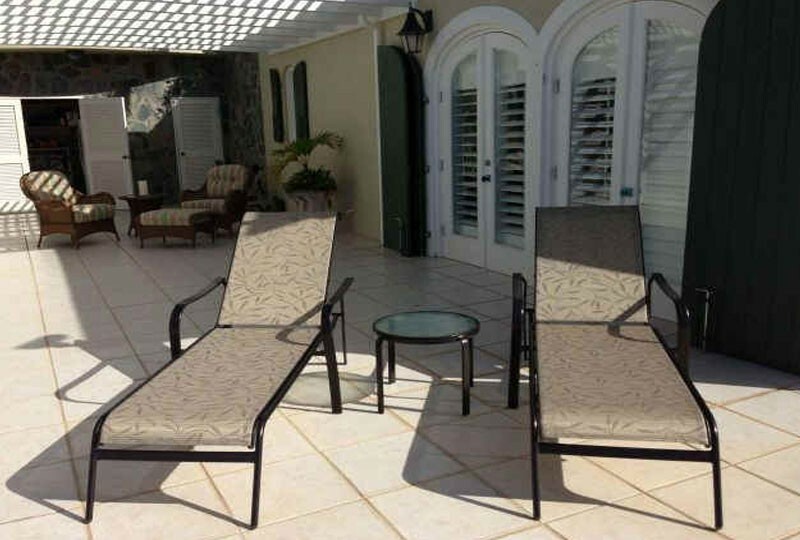 Just beyond you will find chaise lounges for the sun lover and two large barrel chairs with small table and ottoman all with views to the Caribbean sea. The inviting pool and jacuzzi area. The heated swimming pool is 30X14 with bench seating and jack knife edge. 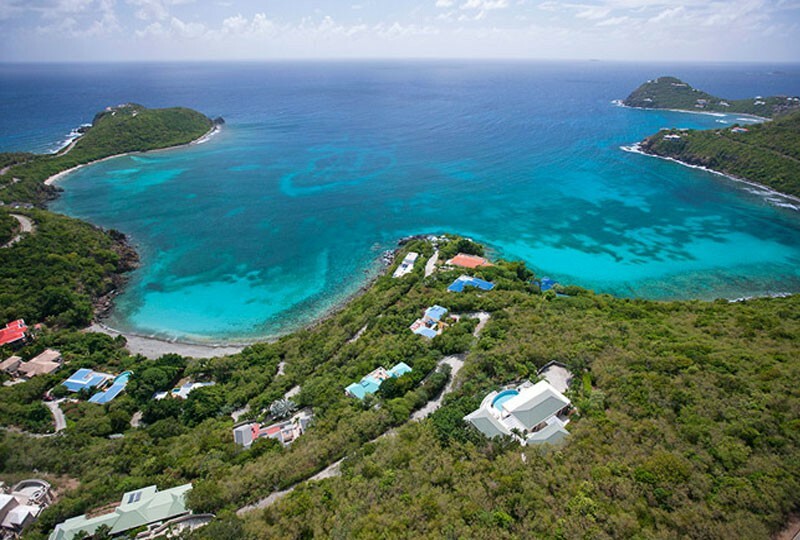 From the pool or the 6-8 person deluxe jacuzzi enjoy views of Klein Bay beach and Ditleff Point as well as the expansive ocean views and south to St. Croix. The air conditioned Media Room is perfect for watching a movie, relaxing or playing a game. A large leather sofa with two comfortable sitting chairs, an ottoman and rocking chair are included as well as a coffee and end tables. A video library, games, and books are included for your viewing and listen pleasure. A desk area with printer, copier and fax machine for those who are unable to leave work at home. Deposit Information: A deposit of 50% of the total rent is required to confirm your reservation. The balance is due 60 days prior to arrival. The deposit is refunded if re-rented, less 20% administrative costs. 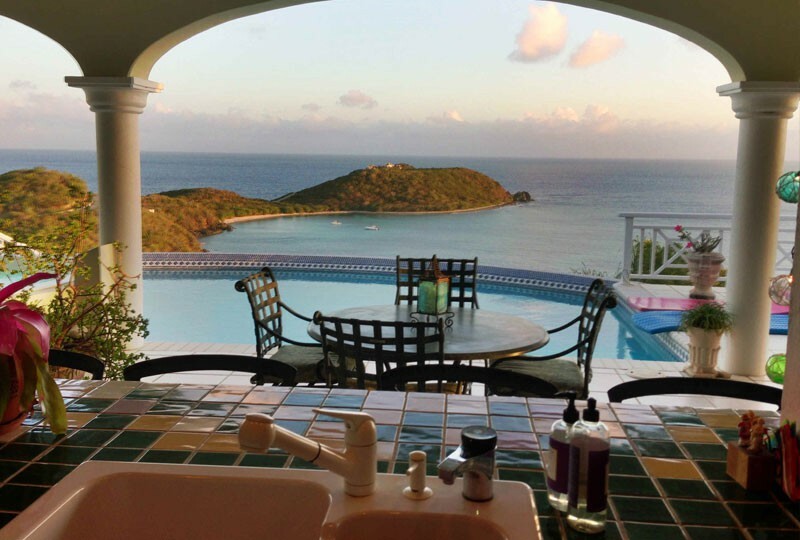 Not included in the rental rate is an 10% Virgin Islands Hotel Tax and a $1,000.00 refundable security deposit.